Here is my entry to Leah's Monthly Challenge. She uses beautiful pictures for inspirational challenges. Pop on over and check it out. Even though I have a WHOLE month to do the challenge, somehow I usually miss the deadline... What the?... How can that be? Well... I always think that I have PLENTY of time... and then it's passed! But no, not this time:) Just made it though!!! LOL ... Maybe next time I will be more organised.... Or maybe NOT! ROFLOL!!! 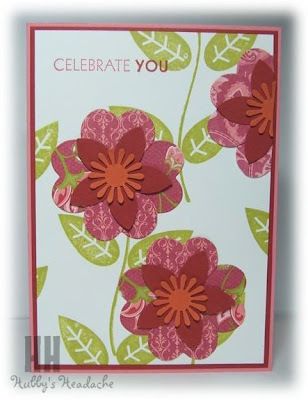 Edited to add: I have used 'Petal Pizzaz' for the leaves and stems, 'A little Birthday Cheer' for the sentiment and I have used punches for the flowers. Hearts (Not SU) and DSP for the base flower and the '5 Petal Flower' punch and one of the flowers from the 'Spring Flower Bouquet' punch. This looks gorgeous Deb! What set have you used? This is gorgeous Deb! I love how bright and cheery it is! Stunning card Deb, love it, your soooo clever!